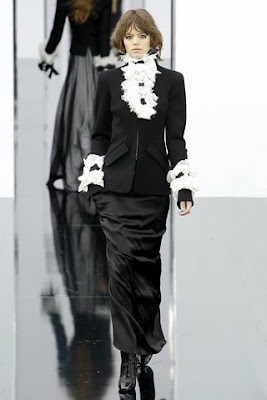 Like Pre-Fall 2009, this collection for Chanel was bursting with hijab style inspiration. What caught my attention first were these loose, flowing maxi skirts in sheer black layered over white, teamed with more structured jackets. Although most of the outfits kept to a simple monochrome pallette, they incorporated plenty of feminine detailing like ruffles, pleats and bows. as always i find your site sooo well informed and so hip. I would like your opinion today I bought a Michael KORS bag for 365€uros; and it's still its bag and i'm feeling guilty. Do you this islam wise that's ok to buy expensive items. If you do only a couple of times a year. I prefer buying one bag a year and that it's nice and good quality then plenty cheap ones. And it was just my bday so i wanted something nice. omg!! awesome!! the skirts and the abaya-looking-coats are splendid! As salaamu alaikum wa rahmatullah!! insha'Allah, you and your family are well!! Sister, I love coming to your page...it's soo soothing* AL hamdulillah for everything! Love the colour and styles. Black is so elegant.